Okay, I feel like I'm finally ready to weigh in on the deal with fractals. What follows is a very brief primer on fractals and an introduction to how I see them as a metaphor for the human experience. Fractals are self-similar at all scales. This means that the small parts look similar to the larger parts which look similar to whole. Fractals are made from the repetition of processes (recursive algorithms). To create a fractal you begin with an initial condition, you apply a process which creates a new condition, then you apply the process to that new condition and repeat. Fractals can lead to infinite complexity. As the formation process is repeated, the complexity increases. The system quickly goes beyond our capacity to comprehend. Nonetheless, the self-similarity continues and the repeated process is maintains its simplicity. The best natural example of a fractal is a tree. The small branches look similar to the larger branches and all the branches look similar to the tree as a whole. The process for building a tree is to sprout new leaves, branch and move towards the light, drop leaves, rest, and repeat. A tree that is allowed to continue growing through the simple process will increase in complexity while maintaining its self similarity. Before the advent of fractal geometry, the mathematical description of a tree was nearly impossible. The underlying proposal of the Fractal Friends project is that humanity, guided by culture at all scales, is also a fractal. This is especially true when we look at our choices, behavior and how we experience conflict. Our behavior (the questions we face and the choices we make) are self-similar at all scales. We find similar questions and choices in our own psyches, as we do in our interpersonal relationships. The questions and choices we face as groups ranging from families and organizations to countries and humanity as a whole also have that same self-similar quality. The process we follow is to face a decision, to assess the right or wrong response based on our cultural paradigm (which tends to be guided by a choice of how to balance our individual or our group's needs (agency/fear/power) and our need to be part of a collective with other individuals or groups (comunion/limits/love)). Each choice brings us to a new situation and we are then faced with a new decision, so the process repeats. As we become increasingly interconnected as a global society the choices we face become increasingly complex. Our sense of self, of "us," grows as we consider our own needs, those of our community, those of our nation and those of our species and eventually all sentient beings. This is also balanced by an increasing understanding of the other, which similarly ranges from the parts of ourselves that we don't want to accept, to the individuals in our life, to the organizations and companies that threaten our communities, to other nations & cultures nearby and across the world, all the way up to the existential threats to life ranging from asteroids to nuclear weapons. As we make more decisions we will always tend to greater complexity, but the self-similarity of our lives at all scales will continue, just as the choices and the decisions will always be dance between fear and love. 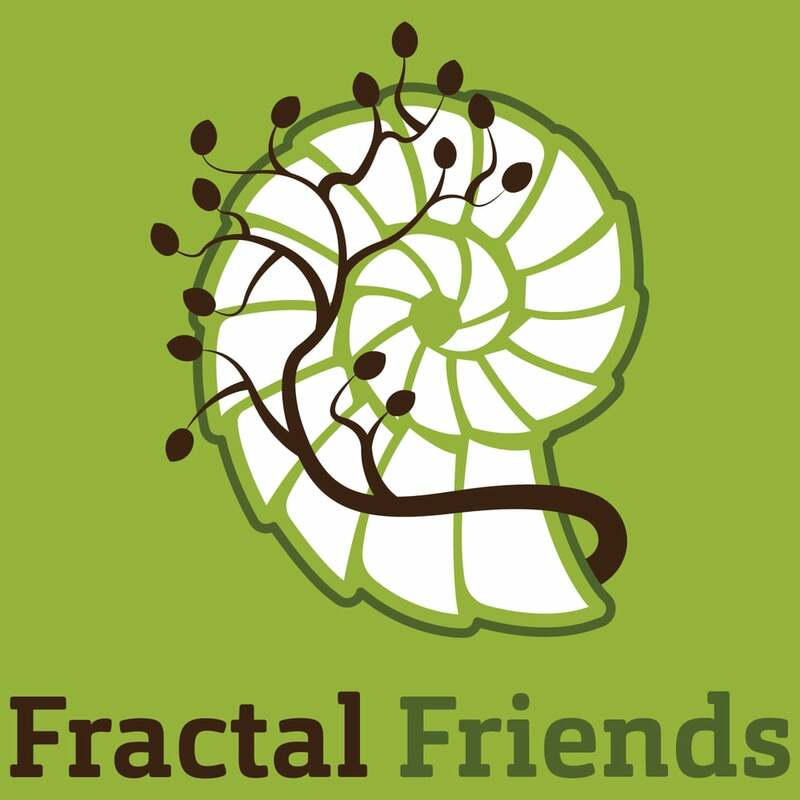 It is in that spirit that I bring Fractal Friends the podcast and the blog to the world. I firmly believe that we are all facing the same questions and challenges in life. I want to share the far off branches of the tree of life that we are part of. It feels important for us to continue growing in our sense of who we are and who everyone else is. The journey both inwards and outwards seems to be infinite, and it has to be balanced. As a way to reflect on this whole idea, I offer a series of fractal images that I feel function as a decent metaphor for life as I see it. To continue the metaphors above, I like to imagine that the edge between black and color represents our choices in life. The choice is there, but as we zoom in closer and closer we realize that there is no hope of finding a definitive edge between right and wrong. If that idea is too far out, I also offer these images as something beautiful and fun to look at. This is called Mandelbrot Set. The following images are all the same image. Each consecutive image is a zoomed in version of the previous. It goes on forever, but I've limited it to just a few, because I don't want to blow anyone's mind just yet. For a deep zoom check this out or google "mandelbrot zoom." Fractals are mathematically defined as objects that exist between dimensions. They are entities that have a Hausdorff dimension that is not an integer. They can be lines that behave like planes or lines that behave like dots. They are a way of fitting infinite detail into finite spaces. For some fun and simple fractal examples I suggest that you look at the Cantor Set, Sierpinsky Triangle and the Koch Curve. If you want to explore the Mandelbrot set on your own consider downloading this app for your phone: Fast Fractal or this software for your computer: XaoS. Here is a TED talk with Benoit Mandelbrot himself. Thank you for your interest in this. If this is a topic that you are into I hope that you contact me.